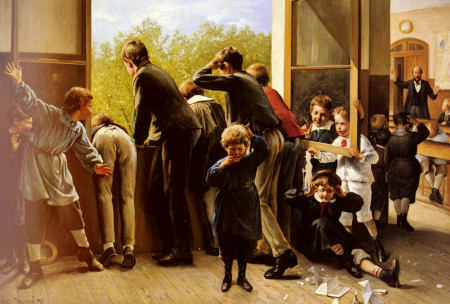 At this point I have the subjects and the books selected from the children for next year. Now I turn my efforts to getting it all organized. I won’t pretend that my way is the only way, or even the best way, it is just the way that works for me so far. And that could change. Many of the ideas I use I have drawn from other people, websites, books, and observation – none of it is really rocket science either. I admit I have a “thing” for binders. So I set up a “Lesson Plan” binder that contains the lesson plans for each child, the weekly plan calendar which lays out the plan for our family learning each week, the children’s weekly folders where I put the children’s daily checklists and any worksheets that are needed for the week. This might sound like things are getting repeated all over the place, but there is a certain practicality about it – at least to me. I have a durable binder one inch binder that I use. It is divided into four sections, one for each child. 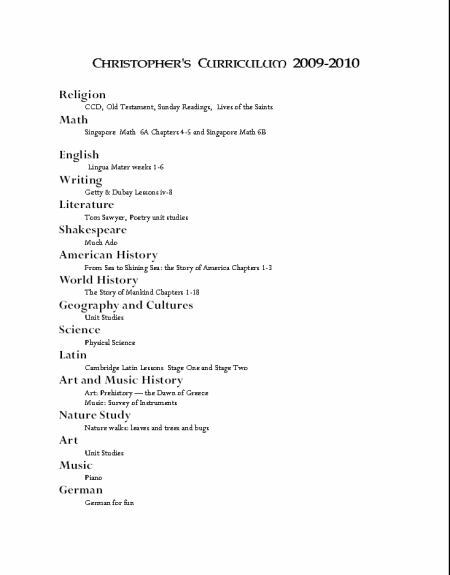 Each section contains a copy of the subject list with texts, each subject laid out on a planner page and the book list for each child. Then each subject is laid out for the 12 weeks on planning pages. I have five columns for days of the week and one column for notes, the 6 weeks per page so each subject is a 4 page spread. This allows me enough space for writing. I made these with MS Publisher, but you could use just about any word processing program or even a spreadsheet. Or you can find printable planning sheets online. This shows a blank layout. 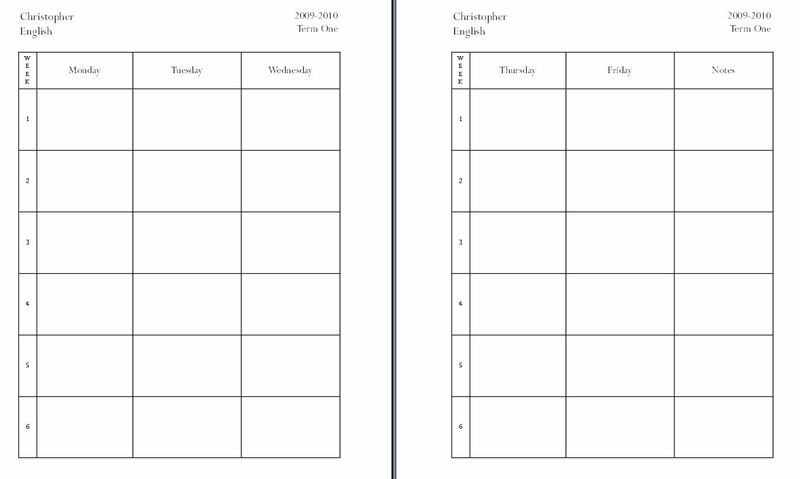 Once I have them all printed I three hole punch them and put them in the binder, then I use these sheets to lay out the weekly plan for each subject. I start with post-its and pencil. Post-it planning is not my original idea and you can see a couple other examples here and here. In each square I write the pages and assignments (trips, readings, crafts, projects) for each day. The reason for using pencil and post-its is because I have to move things around a bit when it comes to putting things into the calendar to sync the four children’s lessons together. Those things that I am pretty certain will work on a specific day (like daily math and reading) get penciled. Post-its are for more time consuming or resource intensive parts, or things that will need to work with the other children’s lesson. So things like history and geography where I try to work with the children more as a group are put on post-its so I can move them easily. I *love* binders, too. (Binder love is the cause of my “lament” over the planner I bought.) Even though I got that woman’s planner for myself to use, I will still make individual binders for each of the kids, as always. My weekly plan pages look the pretty much the same as yours and then I have a daily page that I make for the kids, too. They feel less overwhelmed looking at a day instead of a week. I’ve never used the “post it” method, but have often used the “edit and reprint” method! Can I just say I’m starting to feel like a real slacker since I’ve not started a darn thing for next year?! I’m not quite to planning next year’s lessons, but I am beginning to assemble book lists. I seem discombobulated this year, and can’t seem to get a handle on anything. In fact, more than once I’ve gone to delete my blog altogether. Life is very unsettled in our little home, and I just want it settled – now! lol Patience may be a virtue, but it is one I have always lacked. Anyway – I hope this finds you and yours well and enjoying the summer – where do you live? Have a very blessed week! You are currently reading Homeschool – Planning for Next Year – Lesson Plans at Simply Catholic.